Get your Omega-3’s! If you can’t make it out to catch your own fresh salmon, our friends at SeaBear have just what you need. 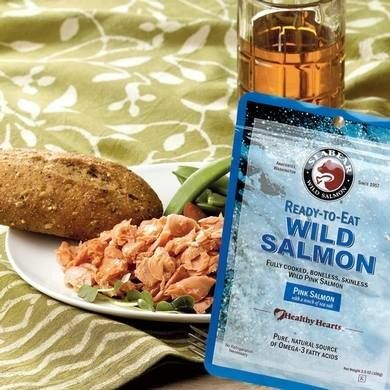 Their delicious “Gold Seal” smoked wild salmon and Ready-to-Eat pouches of Wild King Smoked Salmon, Wild Sockeye Smoked Salmon, and Wild Pink Salmon will have you drooling. The bags are vacuum-sealed (read: no leakage! ), require no refrigeration, and last for at least 4 years (not that this would happen since they are sooo good!). On your next hiking foray or camping trip, pop in a bag or two of the Ready-to-Eat pouches and you’re set with a delicious meal that’s healthy and tasty. They also have a wonderful program called Treat the Troops: for every pouch of SeaBear Ready-to-Eat Wild Salmon that you donate to deployed military personnel, SeaBear will match it with another pouch. How kind is that! SeaBear has a wealth of products available from these convenient pouches and bags to quick frozen, fresh fillets to savory appetizers to an array of gift baskets, so check out their website for more details!